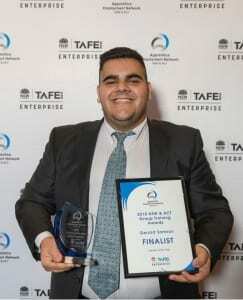 Congratulations to our wonderful ARCie Gerard Samson who won the Trainee of the Year award at the Apprentice Employment Network 2018 NSW & ACT Group Training Awards! We’re very proud of Gerard for his hardworking, proactive nature and strong work ethic which got Gerard into a job with the host company of his business traineeship, Westpac! Gerard Samson who won the 2018 Trainee of the Year! ARC endeavours to get as many of our candidates into business traineeships as possible, to give them a bright future and a long-term career pathway. Gerard is just one exceptional example of the calibre of candidates ARC brings forth to our renowned host organisations as only the best will do. If you’re interested in hiring trainees for your business or if you want to apply for a 12-month full time business traineeship with ARC, contact us on 02 8833 3999 today and let’s pave the way for your prosperous future today!